Anti-government activists picket in front of the Ukrainian parliament in Kiev, calling for the government to curb the president's powers. Ukraine imposed restrictions on the movement of money out of the country Friday to stabilize its battered currency as it burns through reserves of hard cash. National Bank of Ukraine data show the country's reserves of foreign currency fell to $17.8 billion at the end of January, from $20.4 billion a month earlier. The central bank said the capital controls would be temporary and were part of a broader move to shore up the economy. The hryvnia has fallen by roughly 8% since the start of 2014, hitting a five-year low versus the U.S. dollar this week, as investors took fright at growing political instability. The currency bounced back Friday, but analysts said further falls were likely if Ukraine fails to agree to a bailout with Russia or the European Union. "In the absence of a sizeable assistance package from either Russia or the EU, Ukraine's low level of foreign exchange reserves means that a disorderly devaluation, in which the hryvnia overshoots on the downside, remains a real threat," wrote emerging markets economist Neil Shearing from Capital Economics, estimating the currency could fall by another 20%. Ukraine has been facing deep political and economic uncertainty since President Viktor Yanukovych made a policy U-turn in late November, announcing his government was suspending talks on a planned EU trade deal and instead opting to form closer economic ties with Russia. Russia bought $3 billion in Ukrainian government bonds in December as part of an aid package worth about $15 billion -- and also offered Ukraine big discounts on natural gas. But Moscow now appears unwilling to hand over any more money because of the political backlash. A weaker currency and dwindling reserves are making it harder for Ukraine to pay its debts, including bills for Russian gas imports. Fitch cut Ukraine's credit rating to "CCC" on Friday, implying a real possibility of default. Russian energy giant Gazprom (GZPFY) said Wednesday that Ukraine owed $2.6 billion for natural gas imports in 2013, and may owe as much as $658 million for January. 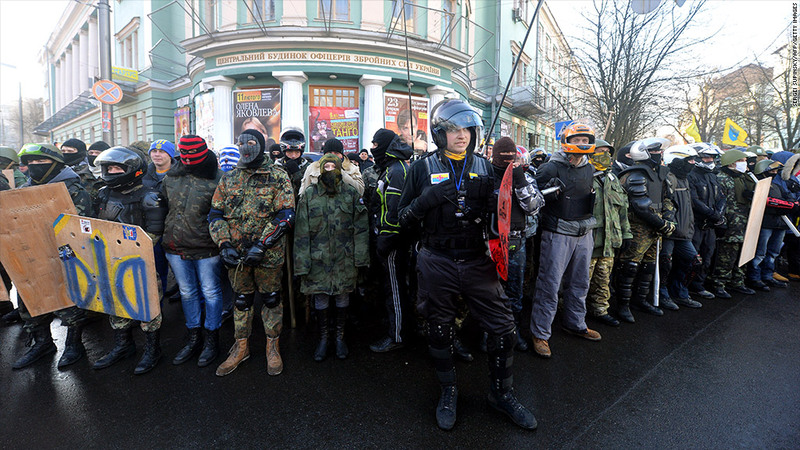 -- CNN's Lindsay Isaac in London and Victoria Butenko in Kiev contributed to this report.